Whenever you feel thirsty, instead of reaching for some soda or a cup of coffee, you better drink a glass of water. 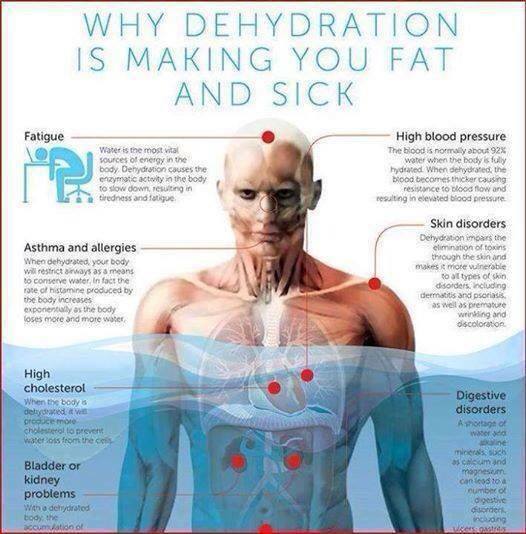 Although your body is 75% water when you are dehydrated, your blood becomes thicker and the blood flow is slower. Whenever this happens, the blood pressure increases, and that, as you know is not good. Every day you lose about 10 cups of water on average through perspiration, urine, breathing and waste elimination. Water provides a number of benefits, but sometimes you just do not drink enough water. The next time you feel dehydrated and need to drink something, make sure you do not reach for a carbonated, sweetened or caffeinated drinks, and drink a glass of clean and cold water. It is the best thing you can do for your body. What are the consequences of an insufficient water intake? Water is the major source of energy in the body. The lack of water slows the enzyme activity in the body, which leads to fatigue and lethargy. When dehydrated, the body tightens the airways as a way to keep the water in the body. The amount of histamine produced in the body only makes it lose even more water. When the body is dehydrated, it will create more cholesterol to prevent the water loss from the cells.